We measure absolute mobility by comparing children’s household incomes at age 30 (adjusted for inflation using the Consumer Price Index) with their parents’ household incomes at age 30. We find that rates of absolute mobility have fallen from approximately 90% for children born in 1940 to 50% for children born in the 1980s. Absolute income mobility has fallen across the entire income distribution, with the largest declines for families in the middle class. These findings are unaffected by using alternative price indices to adjust for inflation, accounting for taxes and transfers, measuring income at later ages, and adjusting for changes in household size. Why have rates of upward income mobility fallen so sharply over the past half century? 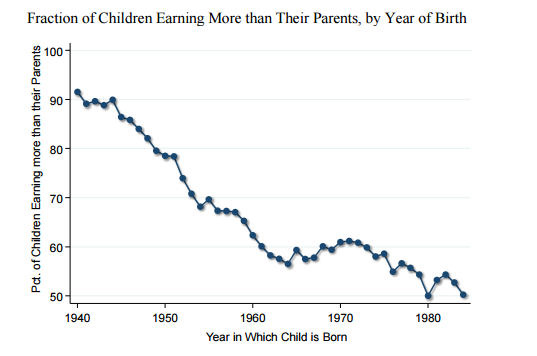 There have been two important trends that have affected the incomes of children born in the 1980s relative to those born in the 1940s and 1950s: lower Gross Domestic Product (GDP) growth rates and greater inequality in the distribution of growth. We find that most of the decline in absolute mobility is driven by the more unequal distribution of economic growth rather than the slowdown in aggregate growth rates. When we simulate an economy that restores GDP growth to the levels experienced in the 1940s and 1950s but distributes that growth across income groups as it is distributed today, absolute mobility only increases to 62%. In contrast, maintaining GDP at its current level but distributing it more broadly across income groups – at it was distributed for children born in the 1940s – would increase absolute mobility to 80%, thereby reversing more than two-thirds of the decline in absolute mobility. We conclude that absolute mobility has declined sharply in America over the past half century primarily because of the growth in inequality. If one wants to revive the “American Dream” of high rates of absolute mobility, one must have an interest in growth that is shared more broadly across the income distribution.